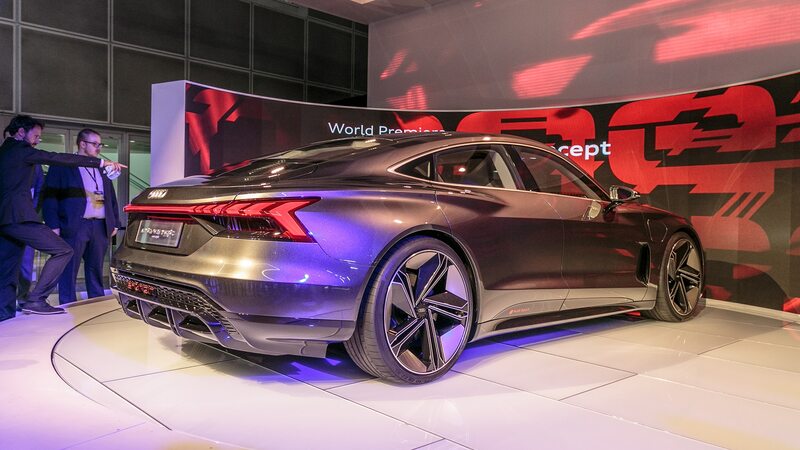 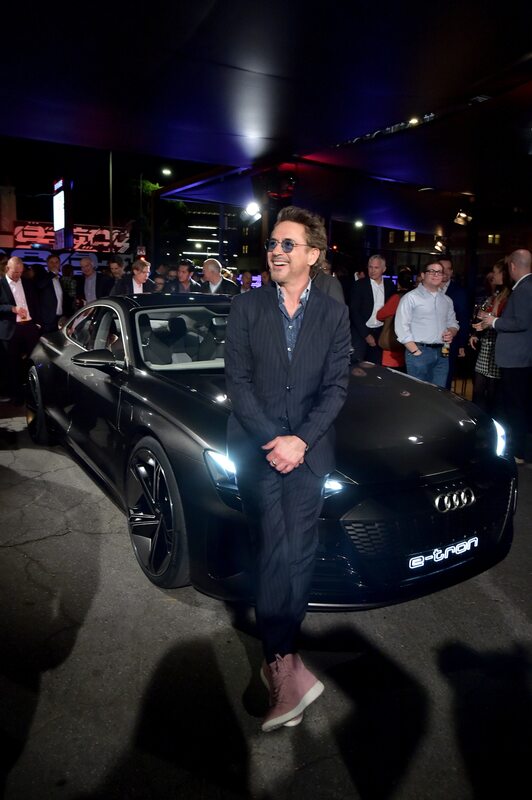 LOS ANGELES, California — “Iron Man” actor Robert Downey Jr. lovingly introduced the all-new Audi e-tron GT concept prior to its 2018 Los Angeles Auto Show debut. 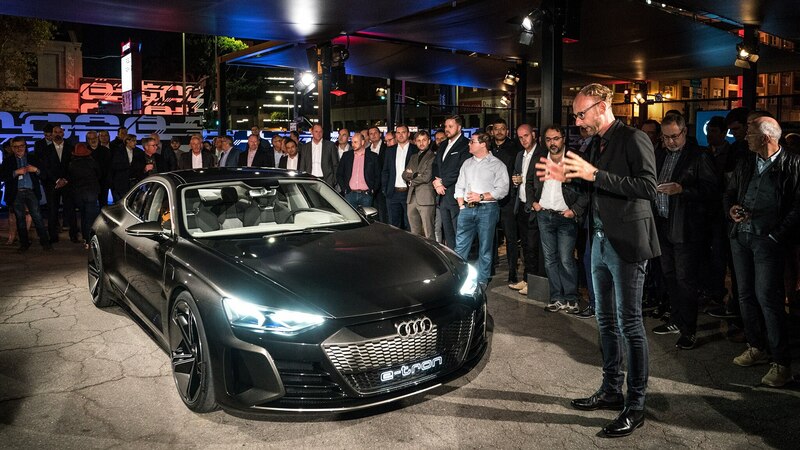 The exclusive event was held in a tented parking lot outside the Ace Hotel in downtown L.A. surrounded by food trucks, auto dealers, and a healthy assortment of seasoned car journos. 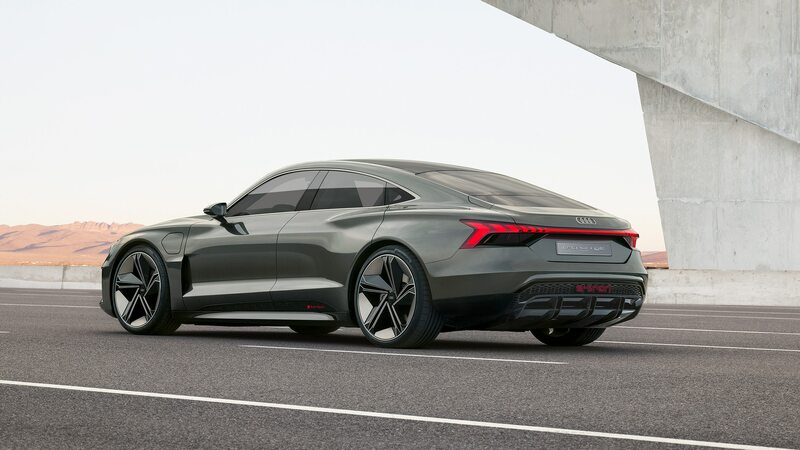 The Audi e-tron GT concept is no mere showpiece, as it is destined to become the third of Ingolstadt’s all-electric production e-tron models, coming after SUV and Sportback variants. 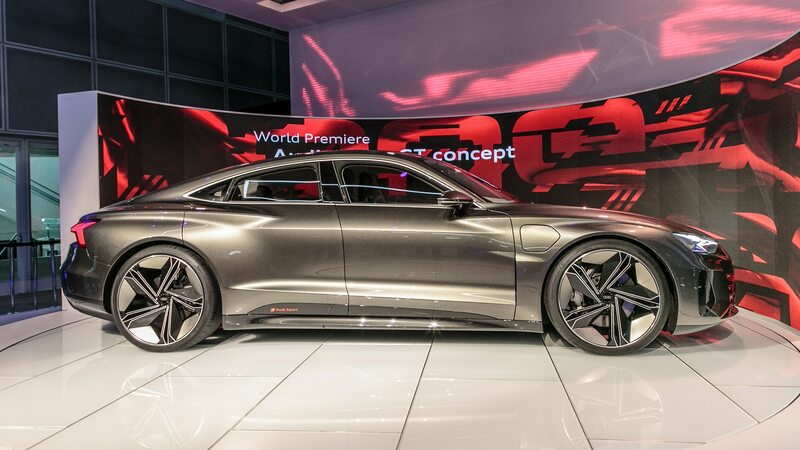 Aimed squarely at Tesla’s Model S, the concept shimmers in Kinetic Dusk paint, a shade of titanium that emphasizes its technological nature. 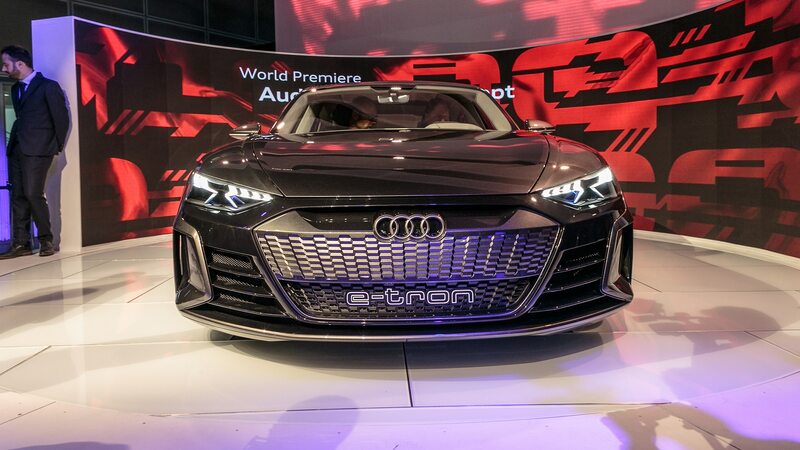 Audi and Marvel’s synergy is a long one and the R8 e-tron was first introduced in an “Iron Man” sequel if you recall. 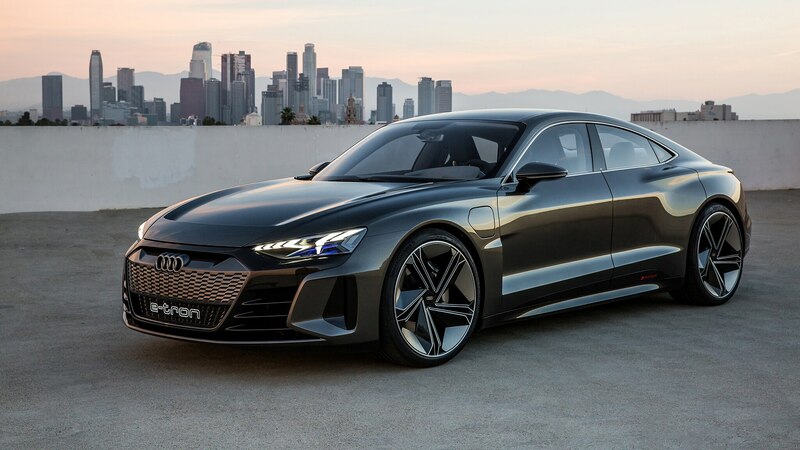 Audi estimates that volume production for this e-tron will begin in late 2020, and conscientious car buyers will surely hope that the sustainable interior materials used throughout the e-tron Gran Turismo concept will make it onto the options list. 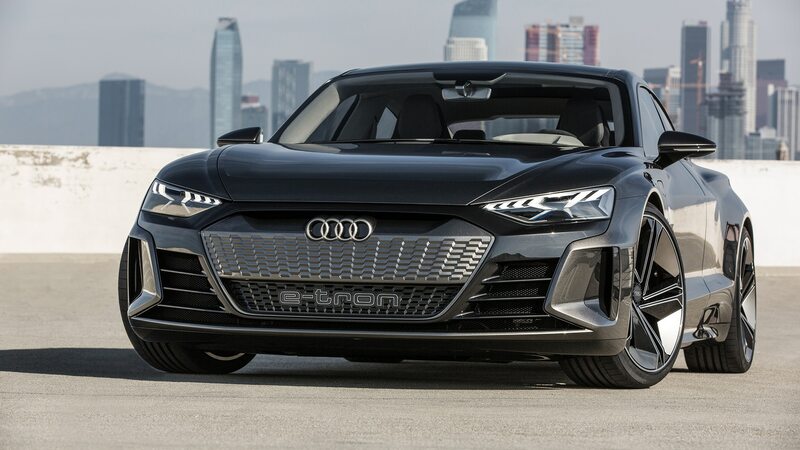 Indeed, no animal-based products were used, which makes the new show car PETA- and vegan-friendly—sorry, hide and fur fans. 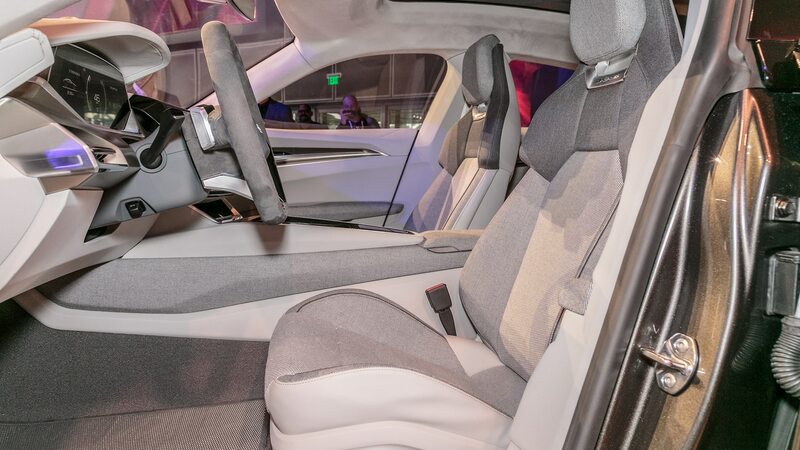 The fabrics employed on the seat cushions, armrests, and center console are recycled, and the headliner and pillar trim is made of microfiber. 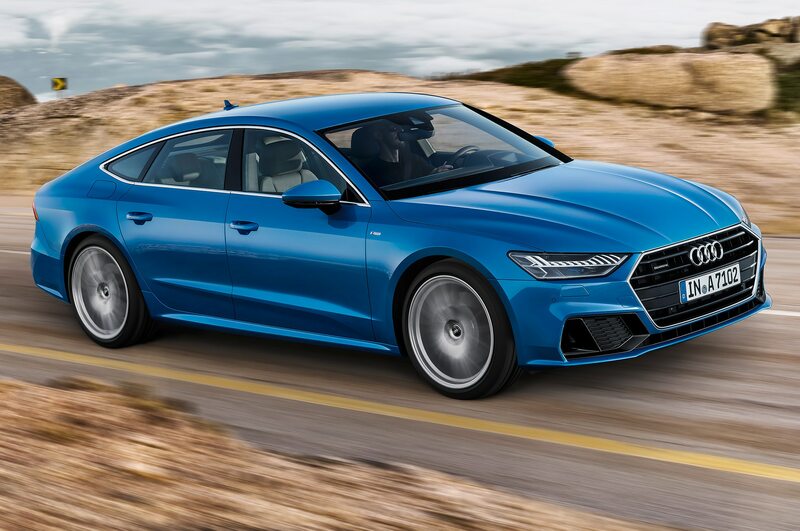 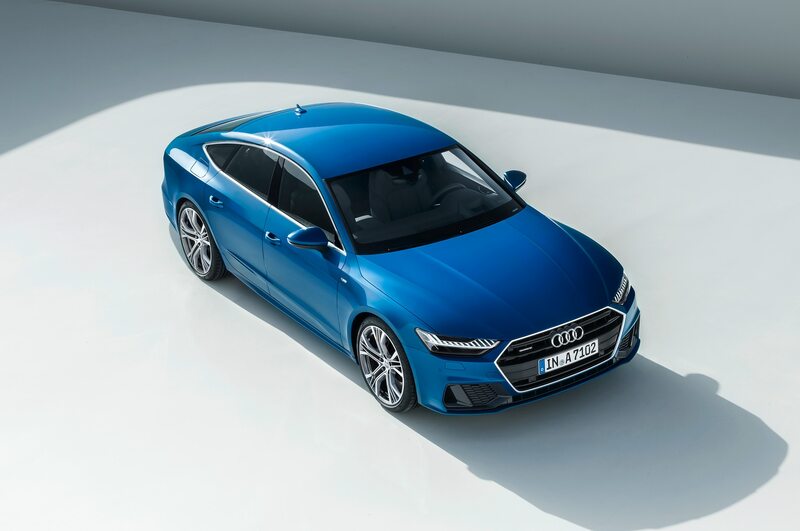 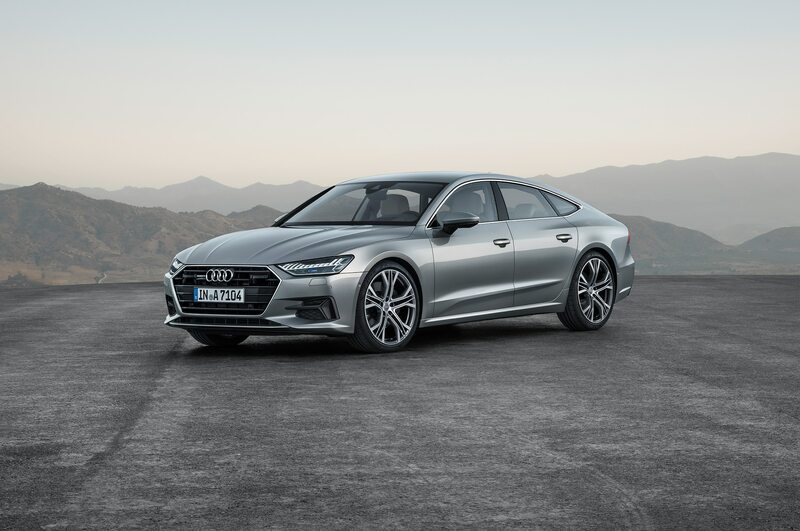 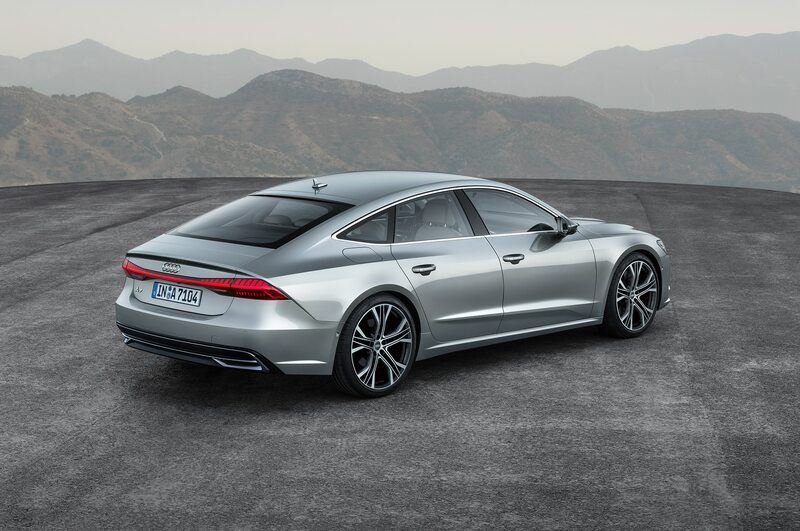 “Even the deep-pile floor carpet is made from sustainable Econyl yarn, a recycled fiber made from used fishing nets,” Marc Lichte, Audi head of design tells us during a roundtable. 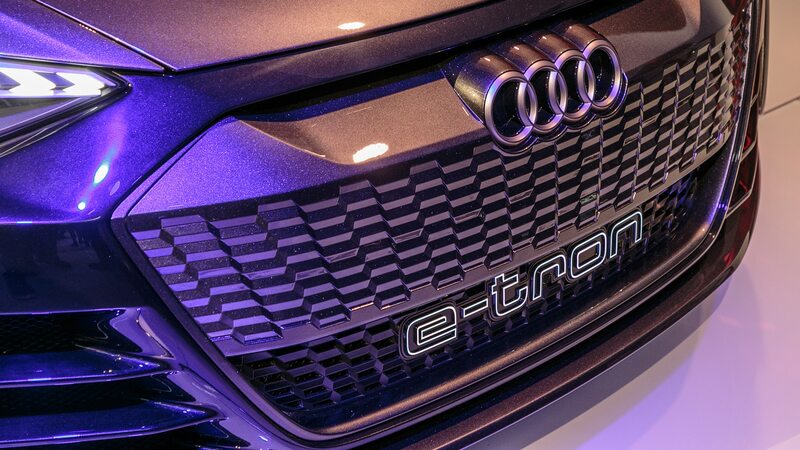 Now, that sounds—and perhaps even smells—very sustainable. 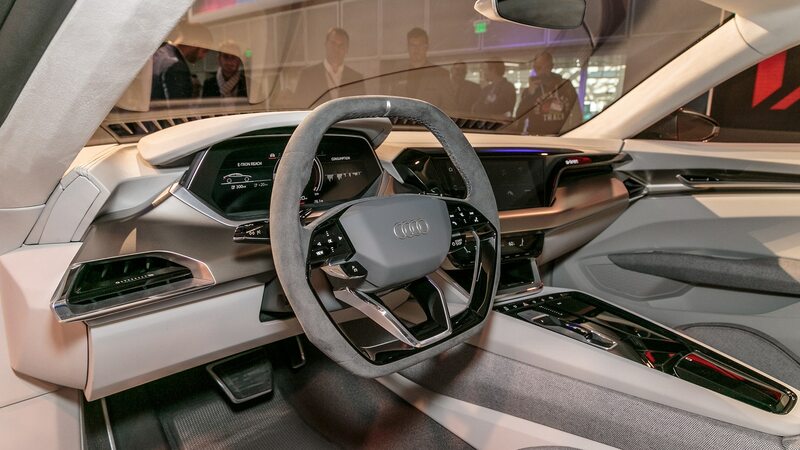 The screens have gloss-black surrounds, and there are two luggage compartments. 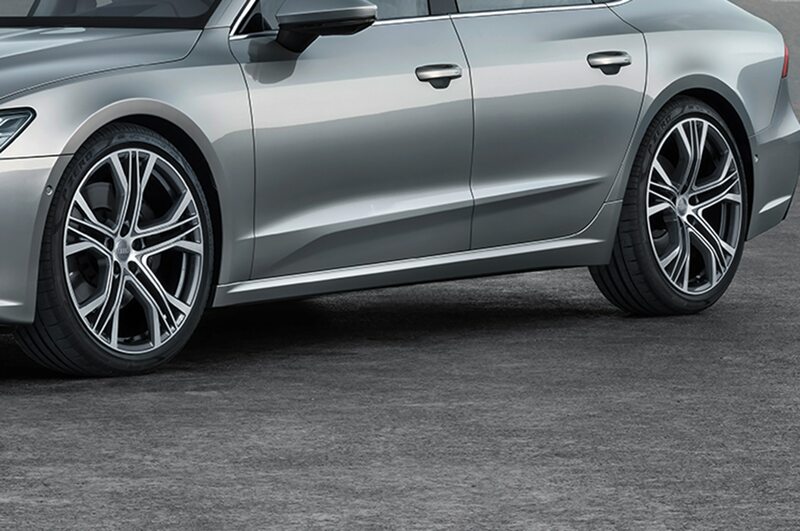 The rear liftgate yawns open to offer up to 15.9 cubic feet of stowage, while an additional 3.5 cubes are available under the hood. 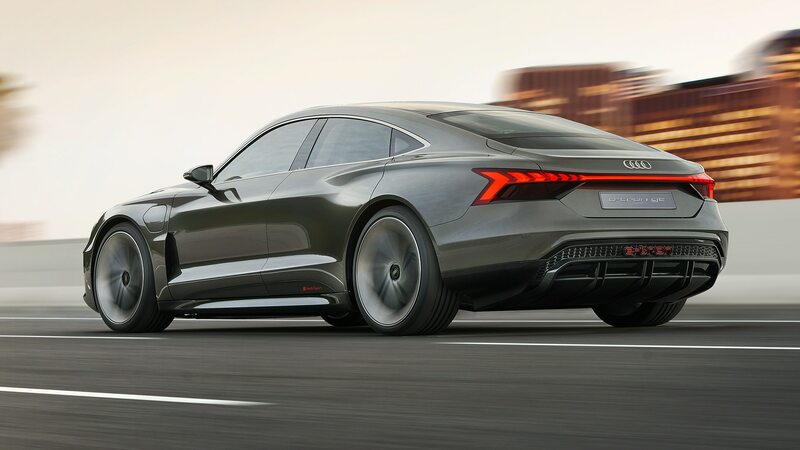 Aside from the ethical escalades noted, the electric-powered four-door GT concept shares a platform with another Tesla-fighter from the VW Group: the Porsche Taycan, which you may know as the Mission E. Long, wide, and with a sloping roof, the Audi, like the Porsche, uses the flat-floor architecture to stuff a 90-plus-kWh lithium-ion battery below the passenger cell and between the front and rear axles. 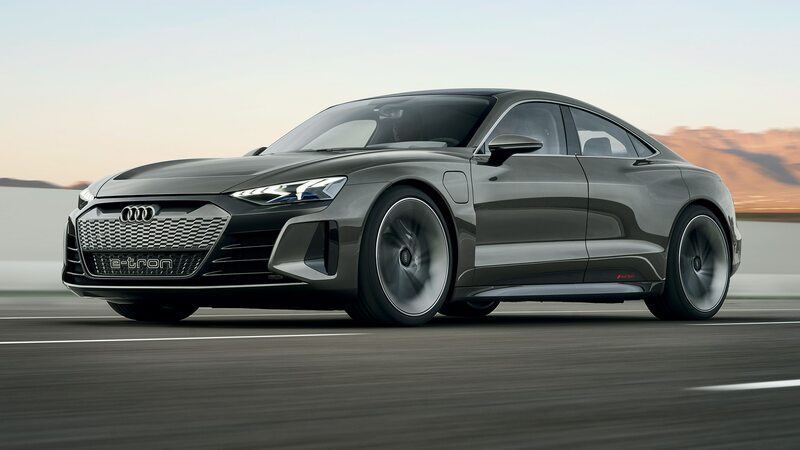 Lichte tells us that the GT’s windshield is the only other part shared with the Taycan, all the other parts are different. 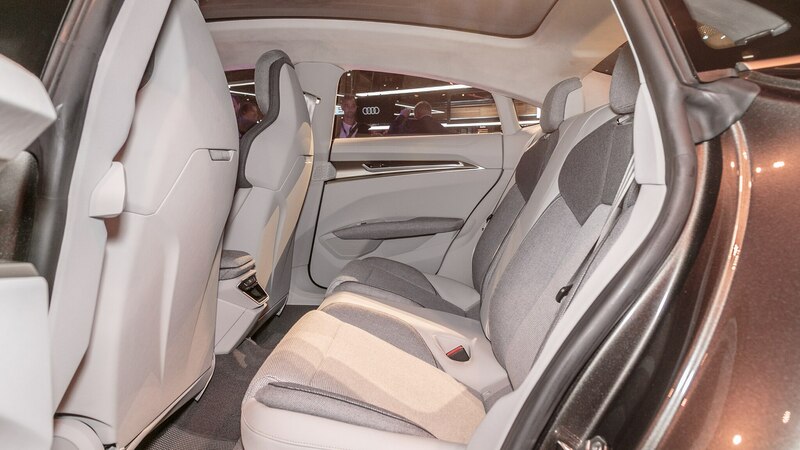 As in the Tesla and other similarly constructed EVs, locating the heavy battery pack there allows for a low center of gravity, more interior room, and the potential for more athletic handling. 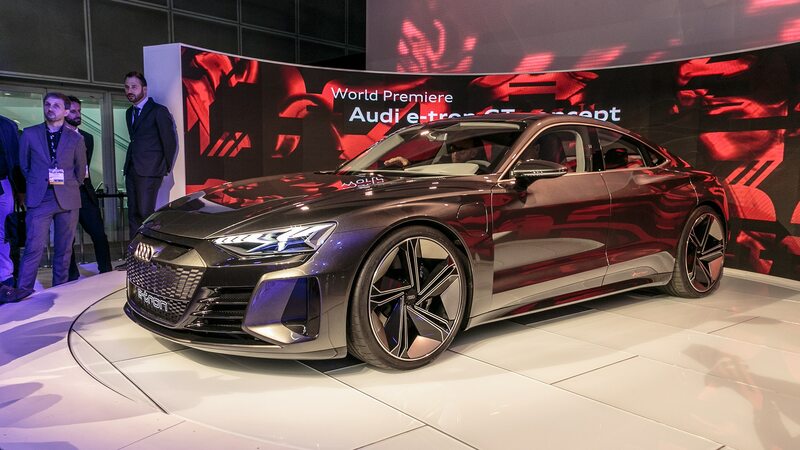 For reference, the concept measures 195.6 inches long, 76.8 inches wide, and 54.0 inches tall, and features a 108-inch wheelbase. 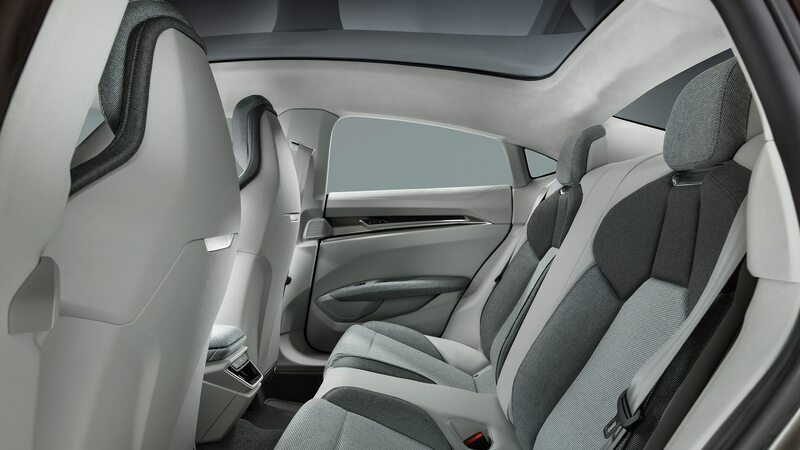 The Model S has a 116.5-inch wheelbase, and is 196.0 inches long, 77.3 inches wide, and 56.5 inches tall. 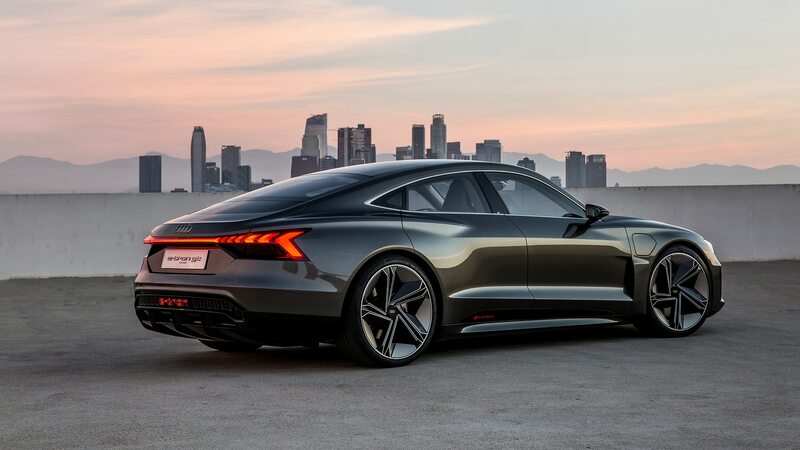 The futuristic four-seater packs electric motors at both the front and rear axles that together deliver a combined 590 horsepower. 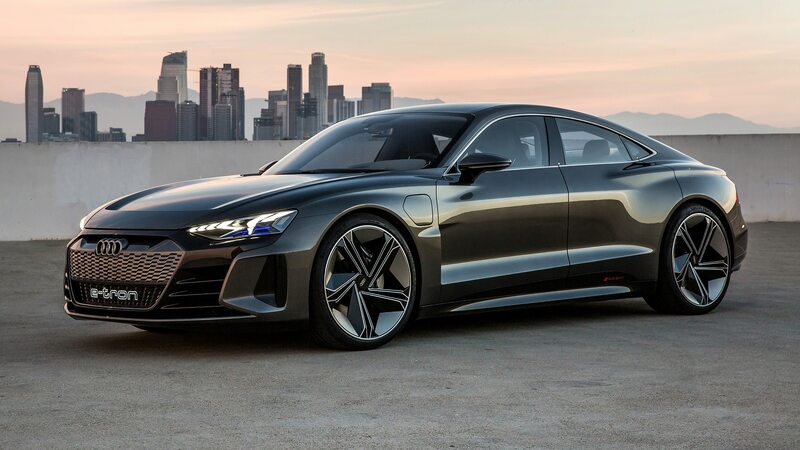 Maximum torque was not announced, but the dual-electric-motor setup enables all-wheel drive with torque-vectoring, and Audi is of course applying its Quattro branding to the system. 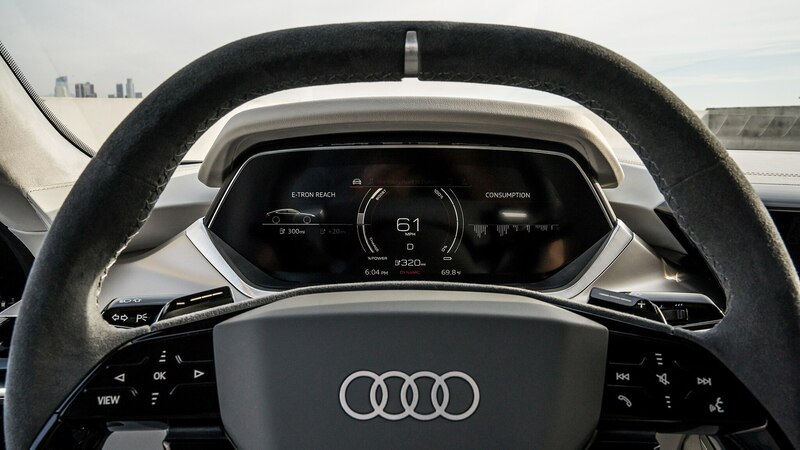 The car also has four-wheel steering. 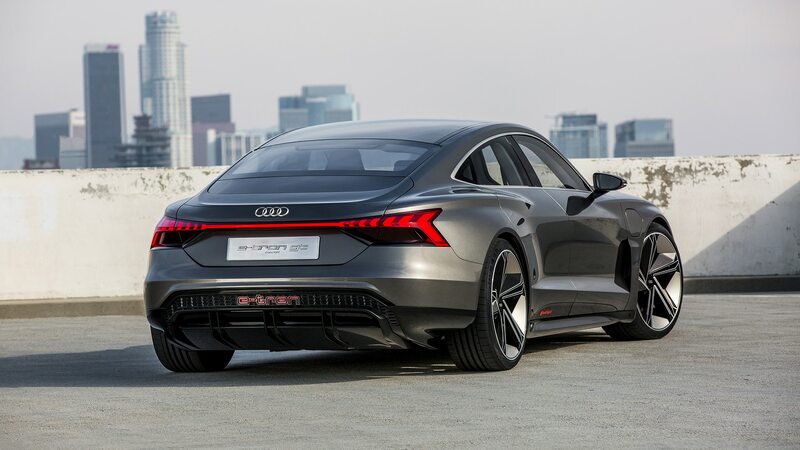 Zero to 62 mph is said to be achieved in “around 3.5 seconds,” with top speed governed at 149.1 mph to maximize the GT EV’s estimated range. 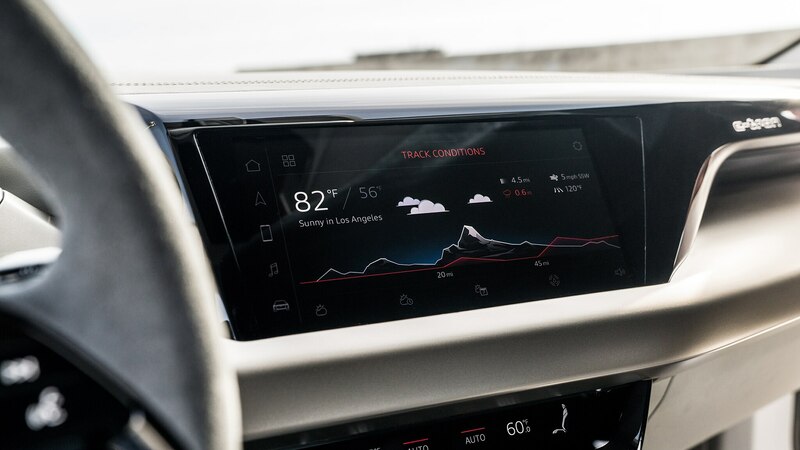 That’s just shy of 250 miles, by the way. 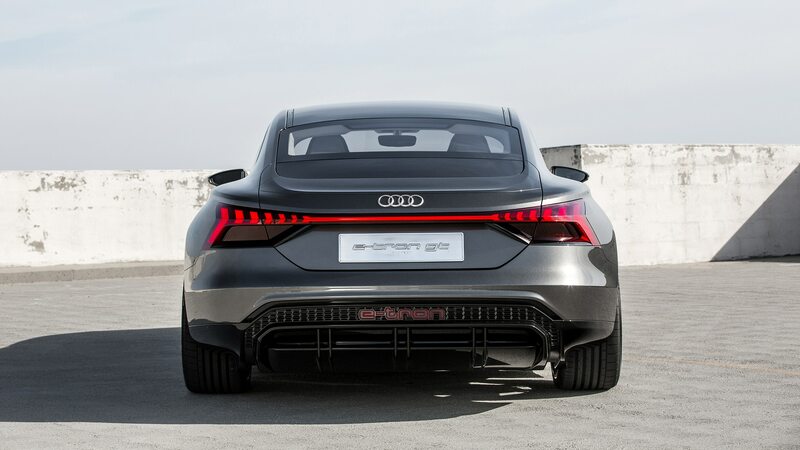 Audi tells us that its energy-recuperation system can theoretically increase range by up to 30 percent. 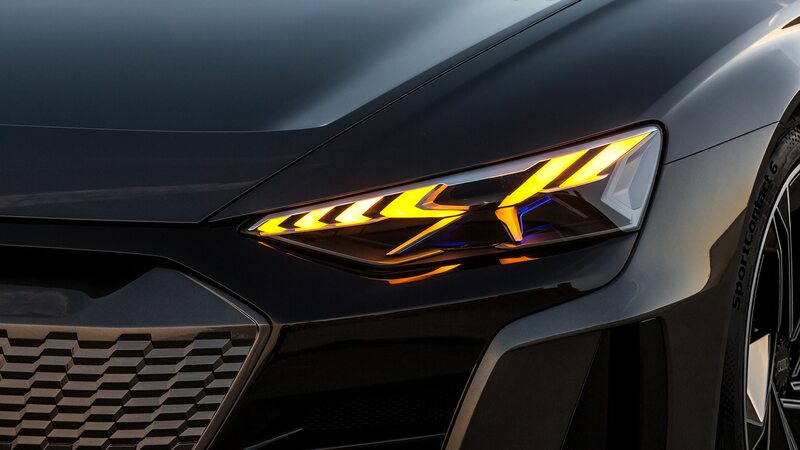 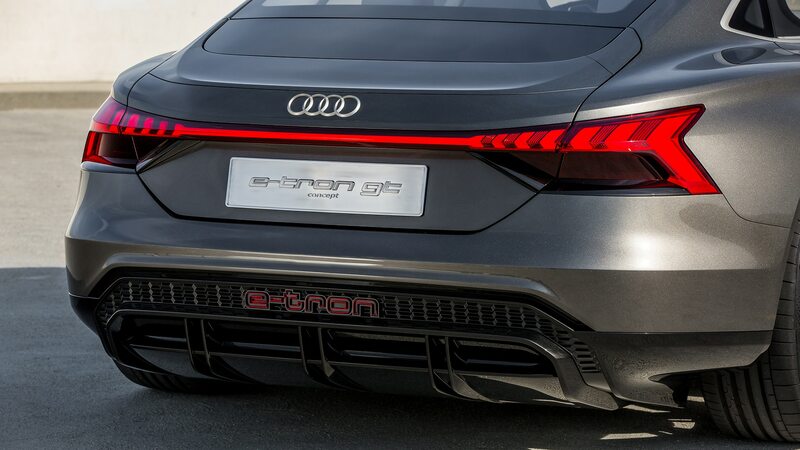 Up front, LED headlights with laser-lit high beams flank a honeycomb grille, and a nifty light strip runs across the entire rear deck above the diffuser. 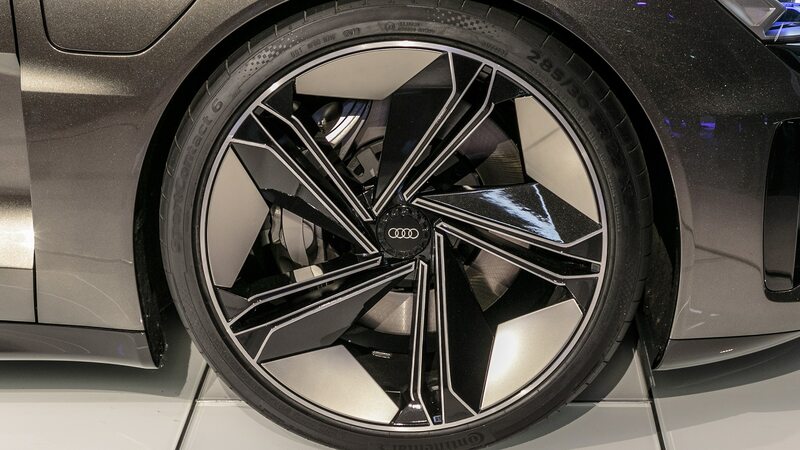 The show car rolls on 22-inch five-spoke wheels shod with ContiSportContact 285/30 tires. 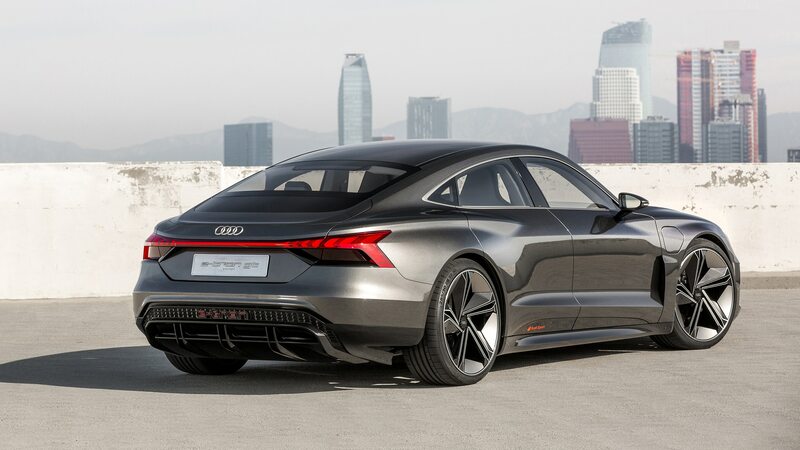 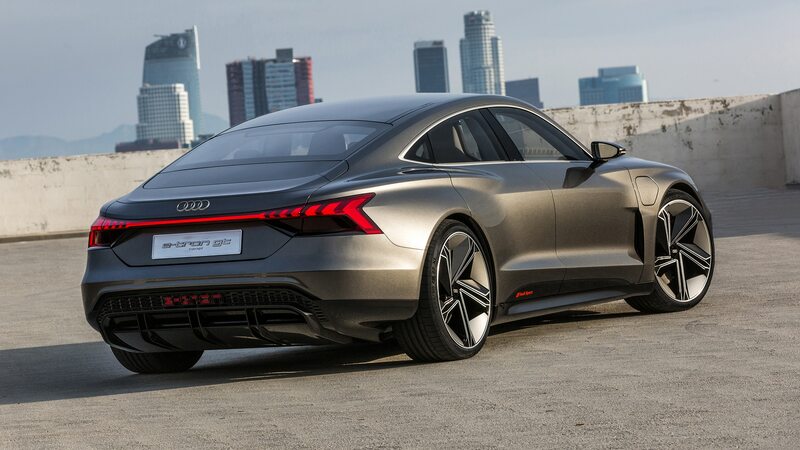 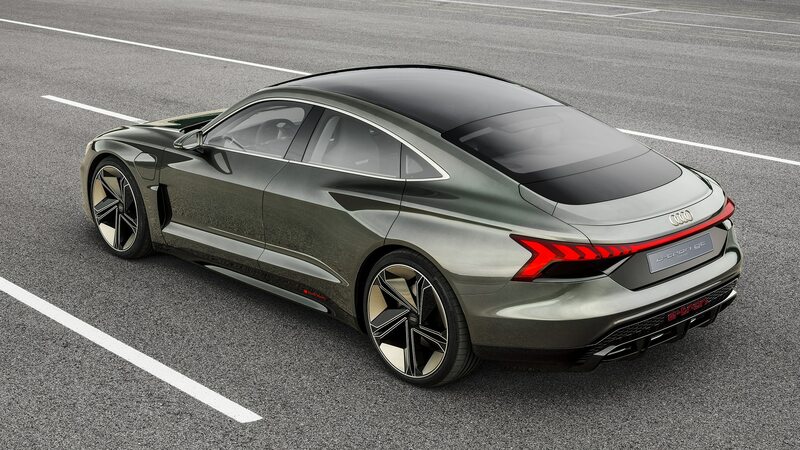 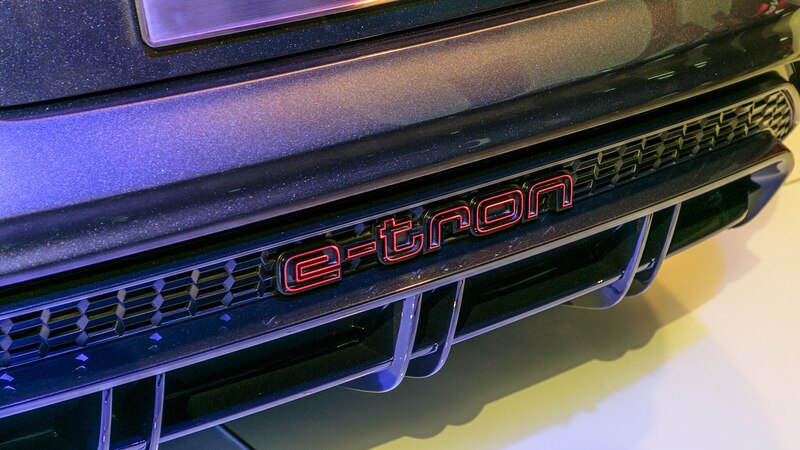 The E-Tron GT concept can be charged using an old-fashioned cable or wireless inductive charging. 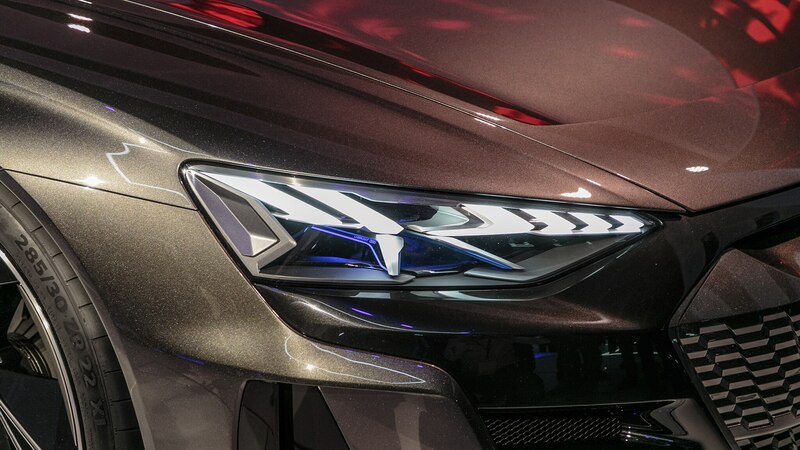 There are two optional charge ports located on each side of the vehicle above the front wheels. 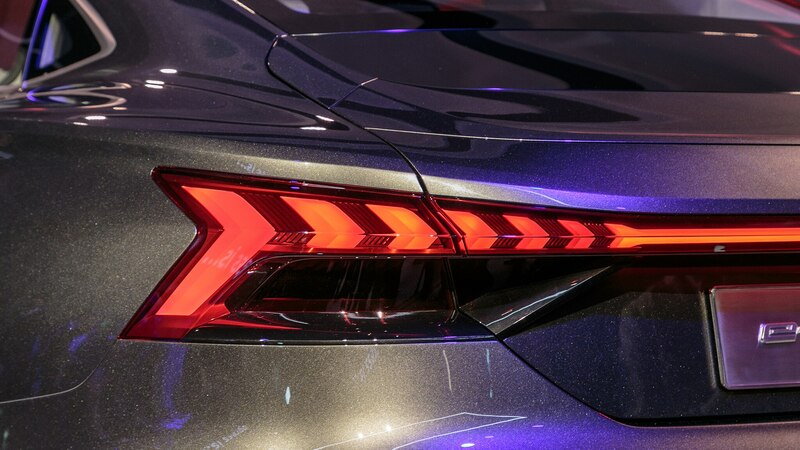 Lichte says that customers can choose either side or both to make it easier to charge on the go. 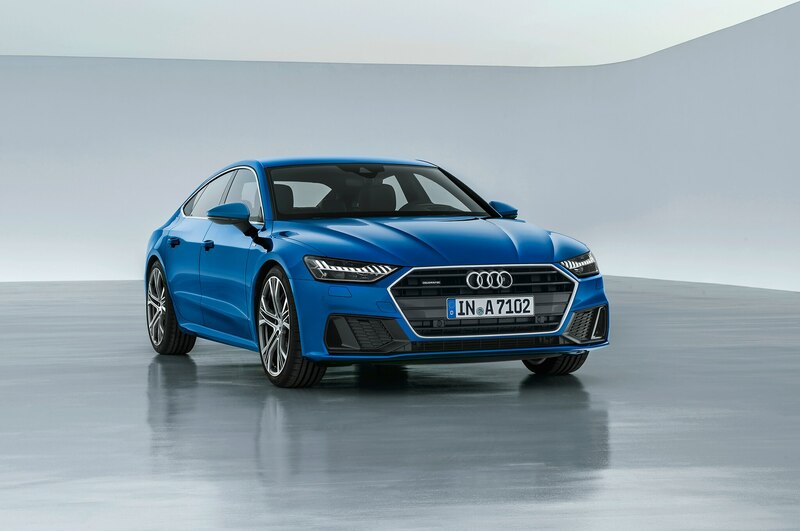 In ideal conditions, the GT can be fully charged overnight using a standard 11-kW onboard unit, while charging times drop significantly if the car is fitted with a higher-capacity system. 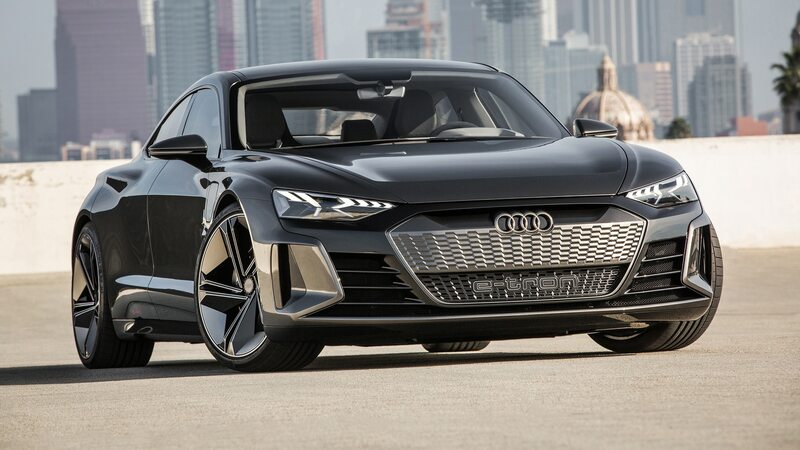 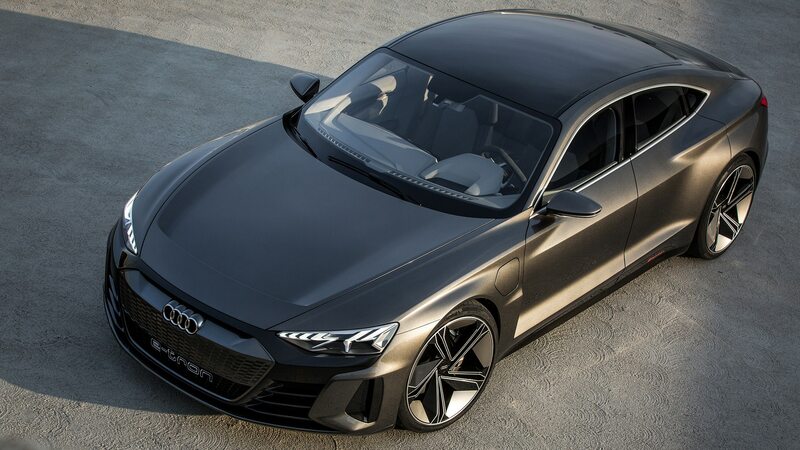 In that case, Audi says it takes just 20 minutes to recharge the battery to 80 percent of its capacity, which can deliver a range of nearly 200 miles. 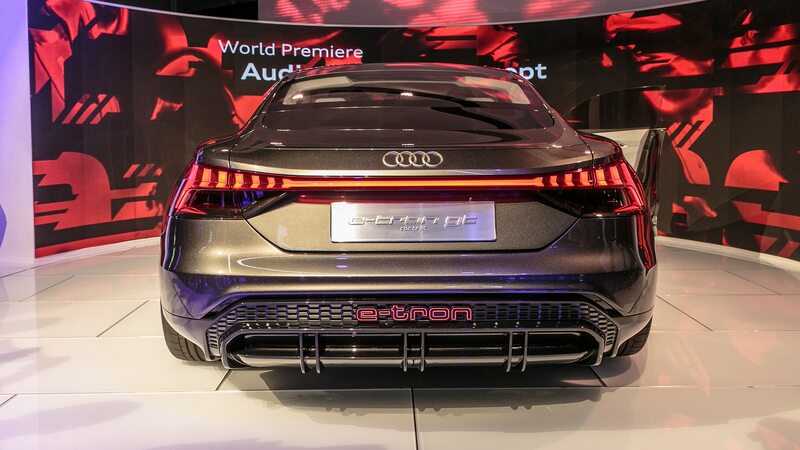 It remains to be seen in the e-tron GT. 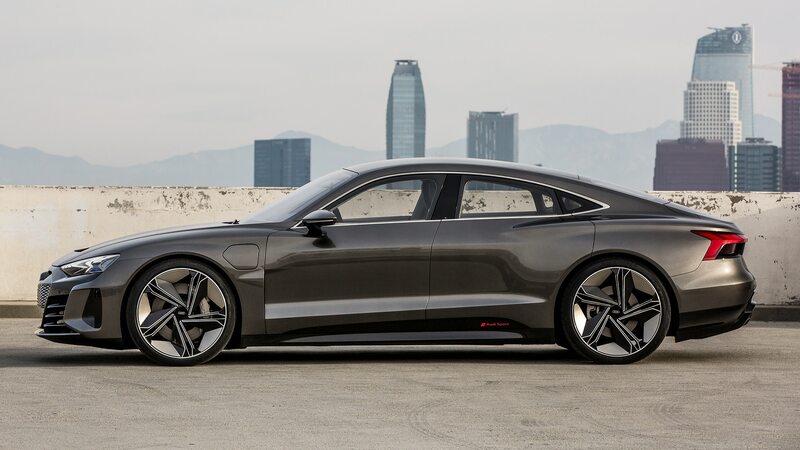 Audi expects to offer a dozen all-electric vehicles by 2025, with the SUV and Sportback expected to land in dealerships next year. 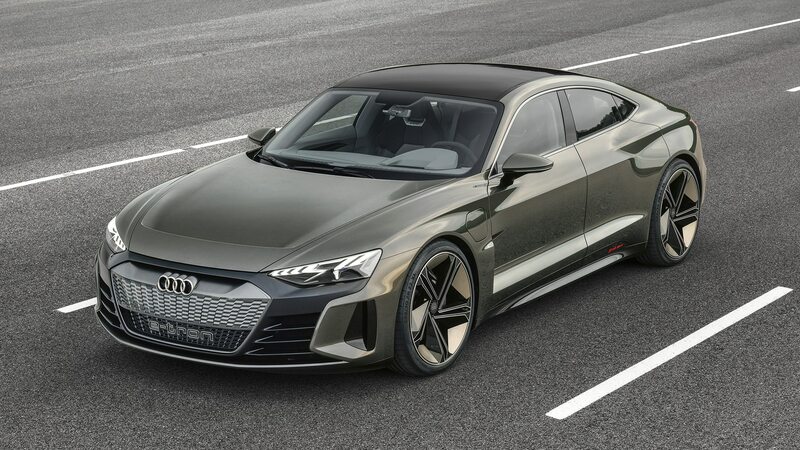 The first deliveries of this GT will occur in early 2021.